Last week we were graced with some unseasonably warm weather. 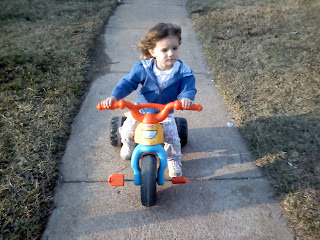 We took advantage of the situation by getting Alyce out of the house for some fun with the neighbors down the street. 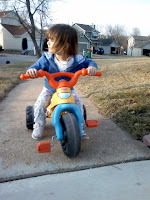 Alyce took her Little Einstein ride toy down the street and we followed with Jake. Like most of our trips down the street we stood around talking while the kids were doing their play thing. Alyce isn't old enough that we can take our eyes off of her, but we can let our guard down a bit as there is an adult looking in every direction at any given point in time. One interesting thing about all the kids playing is that they all want to play with the other kids toys. For instance Alyce brought down her Little Einstein ride toy. This toy is pretty cool; it makes noises, plays music, and lights up. Alyce loves this toy but that is until we get down the street. At that point she gets off her toy and grabs some other toy like a tricycle and begins to ride that. 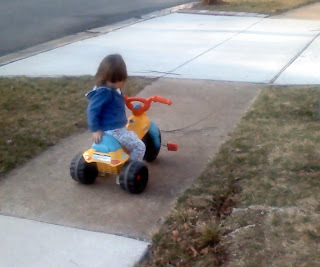 In the mean time some other kid has gone and taken her toy and started riding it up and down the sidewalk. Surprisingly enough none of the kids are possessive of their toys so no fights over toys ensue. After playtime was over and the kids and parents all went inside for dinner we walked back up the street towards our house. About this time our neighbor Liz got home from work. Alyce saw Liz getting the mail out of her mail box and she was off like a shot. Alyce from four houses away ran all the way to Liz's house and gave Liz a great big hug. 0 comments on "A Nice Day Out"